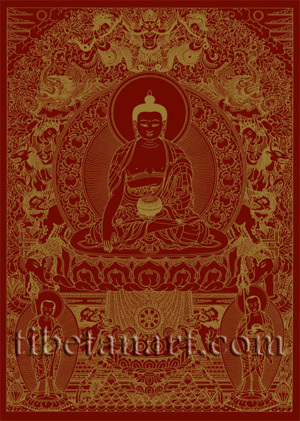 Open edition of signed red on gold Shakyamuni Buddha screen prints available in A3 size (17.5 x 12.5 inches). Shakyamuni, the 'Sage of the Sakyas', the historical Buddha of our present era who lived around 500 BC, is shown here with his two main disciples, Shariputra (left), and Maudgalyayana (right). According to legend Shakyamuni was born as Prince Siddhartha Gautama in Lumbini in northeast India. He was raised in the security of his father's palace and protected from the harsh realities of the outside world, and excelling in all princely virtues he married and had a son named Rahula. But four visions of disease, old age, death, and a religious mendicant turned his mind to the path of renunciation. So leaving his palace with the firm resolution to discover the cause of suffering and the path to its cessation, he adopted the life of a religious mendicant. He practiced austerities for many years until he finally attained enlightenment or awakening as a Buddha under a bodhi tree near the town of Gaya, which is now known as Bodh Gaya . For the remainder of his life Shakyamuni Buddha taught the 'Four Noble Truths' on the nature of suffering, and the 'Noble Eightfold Path' that leads to its cessation, until he passed into Parinirvana around the age of eighty in the town of Kushinagar. Shakyamuni sits in vajra-posture (vajrasana) upon a white moon and sun disc, a multicoloured lotus, and a lion-throne. He wears the three red robes of an ordained Buddhist monk, which represent the attainment of discipline, meditation and wisdom. His radiant golden body is adorned with the thirty-two major marks and eighty minor signs of an enlightened Buddha. From the crown of his head arises his ushnisha or wisdom protuberance, which is shaped like an inverted alms-bowl: above this arises the golden jewel-like crest that represents his enlightened mind, and between his eyebrows is a fine coiled white hair or urna. His left hand rests upon his lap in the dhyana-mudra of meditation, and supports a blue alms-bowl that is filled with the nectar of immortal wisdom. His right hand is extended to touch the earth in bhumisparsa-mudra or 'earth-touching gesture', representing his summoning of the Earth to bear witness to his enlightenment after he overcame the attack of Mara (delusion) under the bodhi tree. His two disciples, Shariputra and Maudgalyayana, stand on lotus pedestals, each holding an alms-bowl in their left hands, and the iron rattling-staff (khakkara) of a Buddhist monk in their right hands. Placed in front of the Buddha's lion-throne are various offerings, such as a heap of jewels, the seven insignia of a chakravartin or 'universal monarch', offerings of the five sensory objects, and a golden wheel with eight-spokes that represents the Noble Eightfold Path of right understanding, thought, speech, action, livelihood, effort, mindfulness and concentration. Behind the Buddha's jeweled golden aura arises the throne or backrest of the 'six ornaments', which represents the six perfections (paramita) of patience, generosity, discipline, effort, meditation and wisdom. At the throne's base are two white elephants that stand upon lotuses, and bow in obeisance to the Buddha as they hold a lamp and incense in their trunks. On the back of each elephant is a blue lion that supports a winged antelope or sharabha, and on the backs of these antelopes are two young gods or devas that hold up a jeweled cross-beam draped with silk. Crouching upon this golden beam are two ferocious makaras or crocodiles with long scrolling tails. Above these are two young nagarajas or serpent-kings, with their lower bodies in the form of serpents and their heads crowned with snakes. And at the top is the crowning serpent-devouring form of Garuda, with a human torso, and the head, wings and legs of a mighty bird of prey. Garuda grasps the tails of the naga-serpents with his sharp talons, and the entire six-ornament throne is surrounded by a profusion of lotus flowers and leaves.